The origins of the colloquial phrase itself are hard to pinpoint; but according to an entry on Know Your Meme, the phrase itself was used in a webcomic published in 2005 by artist Matt Furie via MySpace in which a character performs a grotesque prank on another and leaves him with a simple “deal with it.” Later, an animated gif of a “smug dog” wearing sunglasses with the captioned phrase spread throughout forums on the Something Awful website. As of 2011, the meme spiked in popularity on social media and forums, growing beyond the smug dog and descending sunglasses. 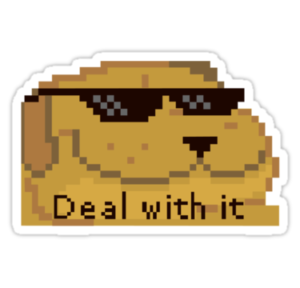 “Deal with it” memes expanded to adopt absurd situations that challenged plausibility, leaving viewers with little choice but to accept what they saw. A great variety of images and animations of this meme composed in humorous, mocking, and serious fashion increasingly populate the Web, which attests to its adaptability and spreadability. The purpose for this meme’s existence is to conclude a discussion or argument which in hindsight is futile due to the subject’s outcome or situation. It helps bring to light that no matter how much analysis can be applied to a certain event or idea, it simply cannot be helped or changed and there is no other option but to embrace it whether a person approves or not.